Definition at line 142 of file control-command.hpp. Definition at line 99 of file control-command.cpp. 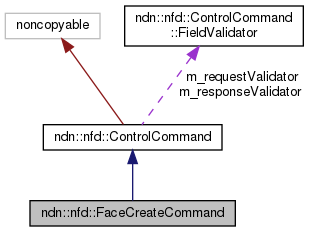 References ndn::nfd::CONTROL_PARAMETER_BASE_CONGESTION_MARKING_INTERVAL, ndn::nfd::CONTROL_PARAMETER_DEFAULT_CONGESTION_THRESHOLD, ndn::nfd::CONTROL_PARAMETER_FACE_ID, ndn::nfd::CONTROL_PARAMETER_FACE_PERSISTENCY, ndn::nfd::CONTROL_PARAMETER_FLAGS, ndn::nfd::CONTROL_PARAMETER_LOCAL_URI, ndn::nfd::CONTROL_PARAMETER_MASK, ndn::nfd::CONTROL_PARAMETER_MTU, ndn::nfd::CONTROL_PARAMETER_URI, ndn::nfd::ControlCommand::m_requestValidator, ndn::nfd::ControlCommand::m_responseValidator, ndn::nfd::ControlCommand::FieldValidator::optional(), and ndn::nfd::ControlCommand::FieldValidator::required(). Definition at line 123 of file control-command.cpp. 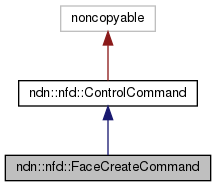 References ndn::nfd::FACE_PERSISTENCY_PERSISTENT, ndn::nfd::ControlParameters::hasFacePersistency(), and ndn::nfd::ControlParameters::setFacePersistency(). Definition at line 131 of file control-command.cpp.